On my YouTube channel, I often release First Impression Videos that summarize my initial thoughts on new content being released in JP and plan to make a stronger effort on my part to bring this information out on a regular basis. The main key point of this video is that the Coin Dungeon and Challenge Mode will be disappearing in October for JP (so 3-4 months time for NA). This means any uncleared level will be a lost Magic Stone. This is done to make room for new content but that content has yet to be determined. TLDR clear your Coin Dungeons and Challenge Modes. Dragonbound & Dragon Caller should be coming back to North America in 2-3 months time so one may wish to start saving Magic Stones for this exciting event. Let me know what you think about the new evolutions along with how many Coin Dungeons and Challenge Modes you still have to do. The Springtime Sonnets Godfest descends on Friday and features a unique 4x rates for featured Pantheon monsters. This is a first, but they picked somewhat questionable pantheons along with only featuring one per day. In addition to this, all rolls will come out as +10 to a random stat. Finally, non-featured Godfest Exclusives will not appear from the Rare Egg Machine. Following the trend of my previous Godfest reviews, I will include a tier list of both the pantheons, GFE, and a list that combines both for each day. Due to the popularity of my previous Japan Stream review, I thought I should continue this trend and pen down my thoughts on up and coming content. I enjoy writing these types of posts as it gives me a chance to condense my thoughts along with not being overly time consuming. There was other content released (such as a modest buff to Ryune) along with small quality of life changes, but this article will focus on the new evolutions. JP has always received content in a timely manner while NA has historically had inconsistent release dates. Thus, I cannot predict when these will be released, but a good guideline is 1-2 months. You can view this in a positive manner as we are able to prep/observe how the new changes will impact the meta. You can read more about the JP Stream through puzzledragonx. Odin Dragon has historically been somewhat of a joke in the PAD community upon his initial release due to how underwhelming he was. Granted he does make for essentially the strongest bind clear for wood teams, the 300,000 Monster Point price tag was hard to swallow and now with Reincarnated evolutions catching up in base stats, there was no real need to purchase him. As such, “Offensive” Odin Dragon was born. Offensive may refer to his hideous artwork, but is better used to describe his now attack-oriented leader skill. The Egyptian 2 pantheon is in an awkward place in today’s meta. They are a relatively new pantheon, but old enough to not have kept pace with the rate of powercreep. Furthermore, none of these cards have an awoken evolution (and probably will not for some time) and this further diminishes their value. Relatively speaking, they make reasonable subs for their respective teams, but may be outclassed by other options. 11 turn CD Ding dong. No, that was not the doorbell, but was Set’s triple dong awakenings! For those who avoid the internet (wise choice), the dong awakening sometimes refers to the Two Prong Attack and is Set’s signature aspect. With 3 TPA awakenings, he has the potential for massive burst damage. As such, Set can find a warm welcoming from Awoken Shiva where his burst potential and damage enhancement active are highly desired. One Fantastic aspect of Set’s active is being able to augment your damage for two turns as well as a heart to fire orb changer. This allows you to conserve actives as you can use Set on the second to last floor with no other orb changer to sweep and then proceed into the boss with the second turn of enhancement. 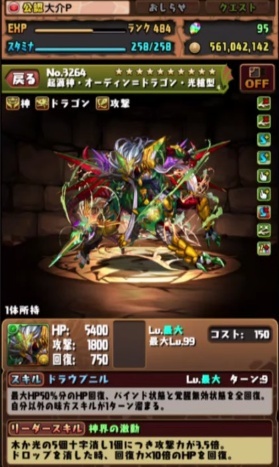 In addition to Awoken Shiva, Set can be utilised on Shiva Dragon teams due to his God typing. This allows Set to be your go to choice for damage enhancement as Awoken Freyr lacks a god typing. In addition, you can use Set on Raoh teams due to his Attacker typing if you need the burst. Unfortunately, fire is lacking a solid end game lead and this is the main drawback of Set as you will struggle to find an ideal home for pushing current content. Furthermore, Set is also lacking a Skill Bind Resist awakening and may place constraints on your team when trying to achieve 100% immunity. For beginning players, Set is a strong leader as he will teach you the ways of comboing and basic orb management. Overall, Set is a solid sub for mono fire teams because your damage enhancement will carry over for two turns. This will help conserve your actives towards the end of a dungeon and ensures you are all set for any encounter. 4 turn CD I am going a little nuts over Nut’s artwork and the whole galaxy theme combined with masks and mystery set my heart all aflutter. I actually have her as my desktop’s wallpaper. Regardless, Nut is an interesting water monster who is starting to see more gameplay with the resurgence of water TPA through Rukia . However, even without any water row awakenings, Nut can still be utilised due to her 4 water orb enhance awakenings. She ensures 80% of all water orbs that appear come with an enhance and is a fantastic way to add additional damage to your team. Her God and Physical typing allows them to fully benefit from Neptune Dragon and Blue Sonia ‘s leader skill. In addition, you can use Nut on I&I / Ryune as a means to frequently proc your leader skill via a 4 turn active. Looking at Nut’s active, you are able to generate 1-5 additional water orbs on a 4 turn cooldown. What makes this unique compared to other orb changers is that she will spawn the orbs in a fixed location regardless of what is already there. This means you can use Nut as a way to improve an already strong board after a full board changer or to override poison/jammer orbs. Furthermore, the column that is generated can easily be converted into a TPA match by moving a water orb from the bottom or top. The main drawback of using Nut is a lack of SBR which could place constraints on team building in order to achieve 100% immunity. Overall, Nut is a solid water sub and although she may not be a source of healthy fat/protein, she can strengthen your team’s output via her 4 water orb enhances. Osiris was designed as the wood counterpart to Nut as he shares the same style of awakenings and active. He also features his wonderful pet, Medjedra, along with stunning art work. Unfortunately, Osiris is seldom seen on many mono wood teams due to the sheer abundance of TPA-oriented subs. Despite the fact that teams like Bastet thrive on additional orb enhances, you may not be able to as easily accommodate Osiris on your team due to a lack of SBR . In terms of a quick orb changer, most players would elect to use Vishnu instead due to the additional Two Prong Attack, SBR, and enhanced skyfall mechanic. Another factor that is hurting Osiris’s viability is a slow decline of wood TPA teams. They have actually become stronger since the inception of Awoken Bastet due to additional subs and skill inheritance. However, their improvement has not kept pace with the current rate of powercreep and players are beginning to shift away from wood teams. One thing to keep in mind with Osiris is that he forms a modest 1.82x HP / 12.25x ATK / 1.82x RCV team that can be used to clear early-mid game descends. Only problem is finding friends who use him. Overall, Osiris is still a strong card, but the teams where he shines have not kept pace with powercreep and his own lack of an awoken evolution dampens his own power. On the bright side, Medjedra still loves him. 13 turn CD Got Milk? Hathor certainly does! She brings joy and overflowing jugs all rolled into one pretty girl in Puzzle and Waifus. It is a shame Hathor was released very late into the game and could not shine bright in the meta as 25x rainbow leads began to go out of style. She is capable of forming a 1.82x HP / 20.25x ATK / 1.82x RCV rainbow team that requires 5/6 elements to trigger activation. This would have made her stronger than the first few evolutions of Sakuya, but the game shifted away from rainbow leads before Hathor could develop a following. Presently, Hathor is mostly a pretty box cheerleaders and potential candidate for skill inheritance as gravity assistant. She could also be used as a mono light sub for gravity, but is relatively eclipsed by Awoken Sakuya in that department. Hathor is still lacking a Bankai or Awoken evolution and either one may be able to resurrect her viability as a tank rainbow team with a higher multiplier could be viable in the current meta. Overall, Hathor is a potential assistant as a gravity through skill inheritance and requires a major buff or evolution to gain relevance as a leader. 8 turn CD Nephthys is an adorkable card in Puzzle and Dragons as she combines cute with a touch of ebil. She also follows the relative trend of the Egyptian 2 pantheon by featuring 4 enhanced orb awakenings and being largely outclassed by other options for her respective role. Even with the buff to her active skill to allow 2 turns of damage enhancement, she will still feel inferior to Loki or other damage boosters. Unlike Set, Nephthys only enhances dark orbs (instead of generating extra orbs) and still requires another orb changer to deal damage. Furthermore, if you are planning to use her active on the second to last floor (as your second turn of damage carries over), you will have wasted the majority of your burst due to the orb enhancement. Thus, you would probably need to use Nephthys on the boss itself and negating the two turn enhancement buff. This may seem a little nit-picky; however, it becomes crucial to min/max at higher levels and you need to be careful of what actives/subs you bring to the party. Looking beyond Nephthys’s active, her God and Devil typing allow her to be utilised on all the popular dark teams: Yomi Dragon , Awoken Lucifer , and Awoken Pandora . The 4 enhanced dark orb add a sizeable damage increase and ensure 80% of all spawned orbs come with an enhance. Furthermore, by being able to enhance dark orbs with her active, you can correct badly spawned full board changers for Yomi Dragon. Nephthys is also capable of forming a modestly strong 1.82x HP / 9x ATK / 1.82x RCV rainbow team that only requires you to match 3 elements. This may not seem that powerful, but you have access to numerous (and powerful) dark subs and you can prioritise rows along with having a 50% uptime on the 1.5x ATK buff from her active with max skilled leaders. You may not be able to find friends, but it is an interesting point to consider and there are numerous clears of higher end content with Nephthys floating around the internet. Overall, Nephthys is a reasonable dark team enhancer, but may be outclassed by other options.